There are many reasons as to why people choose to buy a used motor home as their first recreational vehicle over a brand new one. One of the biggest reasons is because of the depreciation value. The depreciation value can be briefly described as the loss of value of an RV as it leaves the lot for the first time. The dollar value goes down, or depreciates. A used motor home has already experiences the depreciation, so the amount you are buying the used motor home for is nearer to its actual value not the sticker value. Another reason why people buy used is that they feel as though they can get a make and model that they normally would find out of their price range, but because it was once previously owned, they can now fit the high-end RV into their budgetary restrictions. The bottom line is that buying used is and can be a smart decision for the first time motor home buyer. As with any large purchase, new or used, there are some key things to remember and think about prior to buying. Buying an RV is as important as purchasing a second home. You have to make sure that your financial resources are not restricted and that you can actually afford the purchase. 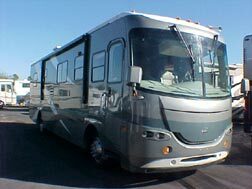 By buying used motor home, you have to depend on someone else’s records of how they have taken care of the RV, and on the person who inspects it. This is why you should depend on a high-quality wholesaler, such as Pedata RV Center, to help you through the steps of purchasing your first used motor home. 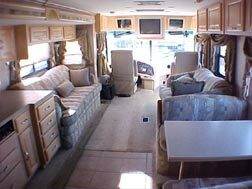 Have the used motor home inspected by an outside party. Go to the NADA website to find out the low, comparable prices for the specific RV you are looking to purchase. Look at the consumer report’s guide for any recalls or take backs on the specific RV you are looking at. If there is not one included, ask for or request on owner’s manual. An owner’s manual will be able to help you to learn the ins and outs of your used RV and will show you detailed directions on how to operate some of the special equipment in your recreational vehicle. Financial and loans are offered to people looking at pre-owned motor homes. One of the biggest differences is that more than likely someone from the staff will be required to come to wherever the recreational vehicle is located for a personal inspection. This is another great reason why you should depend on a full-service, high-quality wholesaler such as Pedata RV Center to help you with all of your purchasing needs (financial needs, inventory, and even home delivery). It is time for you to invest, to explore the country, and to live a life of new memories on the road. A pre-owned recreational vehicle will be both beneficial to your pocketbook and your first time RVing experience!